Project obstacles and solutions: An odd confluence of infrastructure comes together along State Highway 931 in Kokomo, Indiana. The highway passes over Kokomo Creek at the same point where two banks of high tension power lines cross each other. The two lines are supported by a tower that sits in the middle of a retention pond that overlooks the creek. In time, the moving water in the creek began to erode away the bank. There were two concerns. First, the erosion was threatening to wear away the bank that held the retention pond in place. Second, there was a concern for the base of the tower. If the retained water began eroding away the soil in the pond as it seeped over the bank, the structure could be compromised. IMI Aggregates was asked to come up with an erosion control solution. 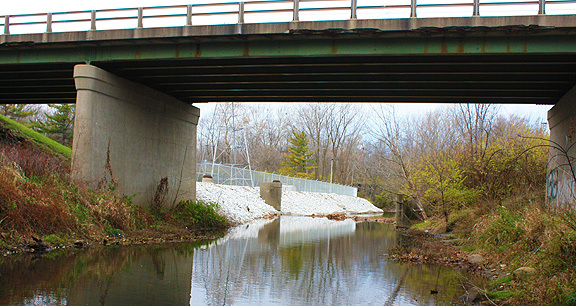 It was suggested that the creek's edge be lined with concrete barriers and the bank be covered with revetment rip rap. IMI supplied 6'x2'x2' concrete blocks that were placed along the creek. IMI also supplied 650 tons of stone rip rap on the bank and surrounding the retention pond. The stone helped keep the soil in place when the creek flooded and also created a barrier to keep large objects from floating into the retention pond. For more information on using stone for erosion control, contact the sales representative for the IMI Aggregates location nearest you. Click here.